The Leeward and Windward Islands describe the eastern Caribbean islands from the Virgin Islands in the north to Trinidad in the south. The author of this work, Maria Woodley Riddell, was the daughter of William Woodley, Governor of the Leeward Islands. First published in 1792 and relating events beginning in 1788, Maria Woodley Riddell would have been only about sixteen years old when she made the trip described in this work. 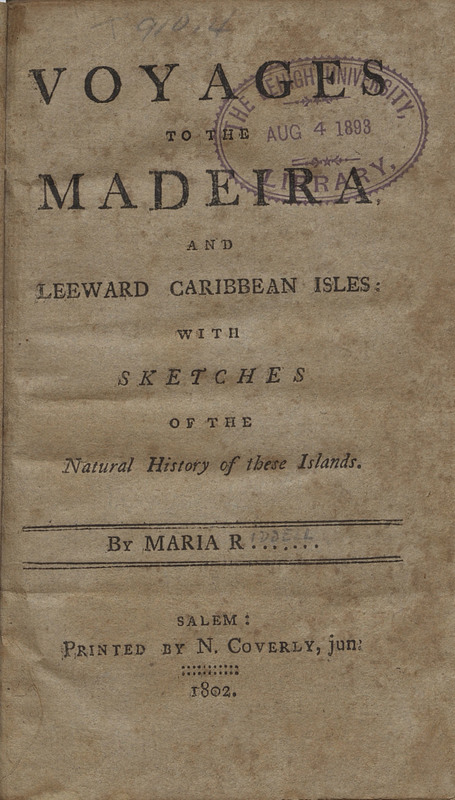 In her introduction, Riddell mentions using the classification systems of naturalists Thomas Pennant and Carl Linnaeus to describe the plant and animal life of the Caribbean Islands. Voyages to the Madeira and Leeward Caribbean Isles: With Sketches of the Natural History of These Islands. Salem: N. Coverly, 1802.